I’m pretty terrible at going to the dentist. I avoid it like the plague and will only go if I am reduced to crawling there in a lot of pain. Little Z on the other hand doesn’t really have many memories on having his teeth checked and on our last visit pretty much sat in my lap and refused to open his mouth for the stranger pointing shiny looking objects at his mouth. Last month expedited our trip to them, mainly on account of my entire face throbbing on one side due to toothache. God it hurt. Realising I haven’t seen a dentist for about 6 years, I made the dreaded phone calls scouring for one that would help me out in an emergency and trying not to succumb to screaming “please just rip it out” down the phone at the secretary. We finally tootled off to one that took sympathy on me; one excited little boy and one very much in pain mum. It was as if Little Z had entered the room of total wonderment when he stepped into the dentists torture chamber office. Gadgets, bright lights, and a big massive chair that magically moved up and down of its own accord. Slightly disappointed he couldn’t touch anything he looked on as I climbed into the not so wonderous chair and relayed my tale of woe to the dentist fully expecting a painful numbing injection and numerous fillings. It didn’t take long before he decided to assist the dentist count and label my teeth and helpfully shouted out random numbers as the dentist instructed the dental assistant. I couldn’t see the dentists reaction but could hear the dental assistant giggling and prayed I didn’t choke on his little mirror thing as I laughed with my mouth wide open. Thankfully I got away with just antibiotics and Little Z walked away with a spiderman sticker even though I was the brave patient. Of course he completely clamped his mouth shut as soon as the dentist jokingly offered to check his mouth. He has since been spending all his days telling people they must brush their teeth or they will fall out. In random cases he will spontaneously prise my mouth open to demonstrate to his audience exactly where one should brush. I try to be patient as he finishes his presentation. My brother takes full advantage of this and keeps asking for an encore. I do wonder what it’ll be like when its his turn to be in the chair next month. At least one of us likes the dentist…for now. 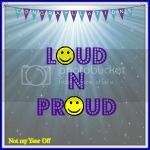 Its my turn this week to host Loud n Proud. If you have any proud little (or big!) moments you’d like to share then feel free to grab the badge and link up below. Old, new, quirky, bold…all welcome! The linky goes live on Thursday morning and will stay open till Sunday night. Bless him! I bet he made their day! Glad you got away with only antibiotics and hope you’ll be going more regularly now! Had to giggle. Do you think Z has found his vocation? Haha, looks like he had fun! Hope you are feeling better, though. This is a great idea for a linky – I’d love to join when I have something suitable to share.